Country music legend Dolly Parton has said her charity will donate $1,000 (£797) a month to families affected by devastating wildfires in Tennessee. The singer said she would provide help “until they get back up on their feet”. “I’ve always believed that charity begins at home,” Parton said in a video statement. 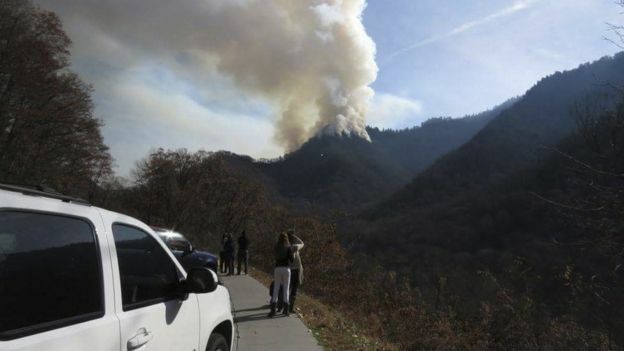 At least seven people have been killed in the fires in Sevier County, Tennessee, and around the Great Smoky Mountains National Park. 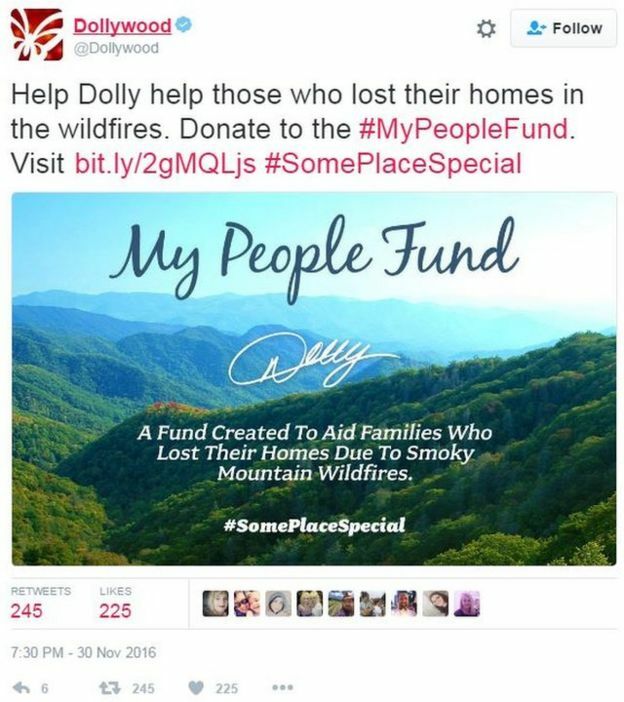 Parton’s Dollywood Foundation has set up a fund where people can donate to help victims of the fires. “I know it’s been a trying time for my people, and this assistance will help,” she said. The wildfires came to the doorstep of Dollywood, Parton’s theme park in Pigeon Forge, Sevier County. A spokesman said guests were evacuated from some of its properties, and that several cabins and holiday structures were damaged. Around 45 people have been treated in hospital as a result of the wildfires, and over 700 buildings have been damaged. Mandatory evacuations are under way around Gatlinburg, a city seven miles (11 km) southeast of Pigeon Forge. Parton, 70, appeared in a public service advertisement on Sunday, asking people nearby to take steps to avoid spreading the fire. Later, she spoke of her misery at the toll the blazes had taken. 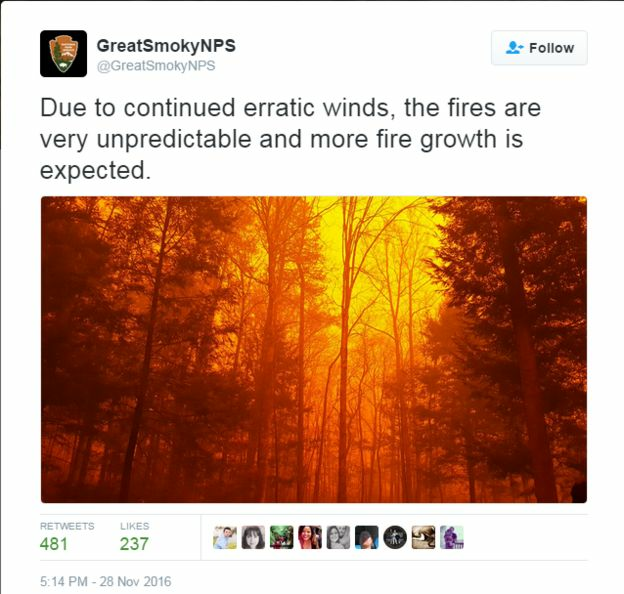 “I have been watching the terrible fires in the Great Smoky Mountains, and I am heartbroken. “I am praying for all the families affected by the fire – and the firefighters who are working so hard to keep everyone safe,” she said. 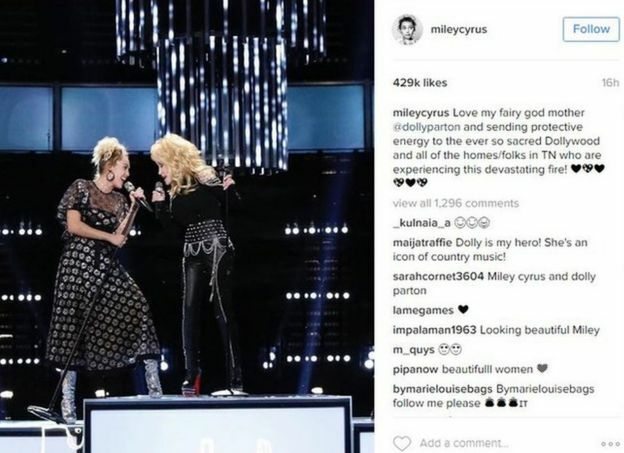 Singer Miley Cyrus, also a Tennessee native, sent her sympathies and support to Parton and the people of the state in an Instagram post. 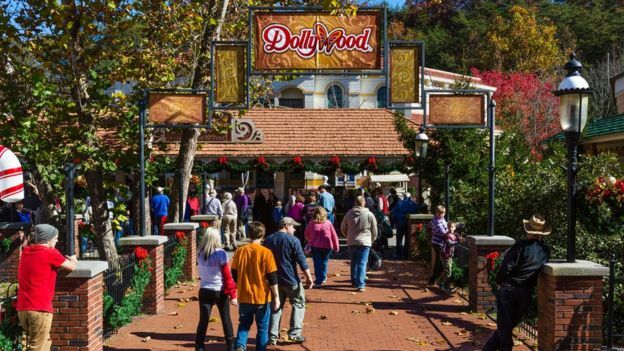 Dollywood will remain closed until 14:00 local time (19:00 GMT) on Friday, while the Great Smoky Mountains – the most visited national park in the US – said it had closed all park facilities and many trails. There is also concern for more than 10,000 animals at an aquarium in Gatlinburg, after all employees were evacuated. The building is still standing, but “workers are anxious to return to check on the animals”, the general manager of Ripley’s Aquarium of the Smokies, Ryan DeSears, told local media. Twenty-six active fires have burned nearly 12,000 acres (4,855 hectares) across the state, Tennessee’s Department of Agriculture reported. Facebook has activated its safety check feature. Neighbouring Georgia, as well as North and South Carolina, are also battling wildfires after months of drought. Singer Dolly Parton sets up fund for Tennessee fires victims 0 out of 5 based on 0 ratings. 0 user reviews.